01. The objective of this Standard is to prescribe the guidance on accounting principles, accounting treatments and presentation of changes in accounting policies, changes in accounting estimates and correction of errors so that enterprise can prepare and present its financial statements on a consistent basis. This standard also enhances relevancy, reliability of the enterprise’s financial statements as well as enhances comparability of enterprise's financial statements from period to other periods and with the financial statements of other enterprises. 02. This Standard should be applied in accounting for changes in accounting policies, changes in accounting estimates and correction of errors of the previous periods. 03. 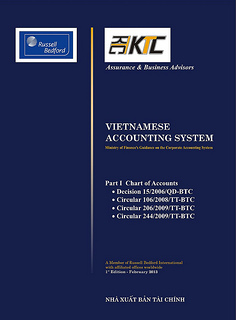 Except for changes in accounting policies, disclosures and application of accounting policies are complied with the requirements of Vietnamese Accounting Standard 21 “Presentation of Financial Statements”. The tax effects of correction of errors and of retrospective adjustments made to apply changes in accounting policies are accounted for and disclosed in accordance with VAS 17 “Income Taxes”. Accounting policies are the specific principles, bases, conventions, rules and practices adopted by an enterprise in preparing and presenting financial statements. A Change in Accounting Estimates is an adjustment of the carrying amounts of an asset or a liability, or the amount of the periodic consumption of an asset that results from the assessment of the current status and of expected future benefits as well as the obligations relating to that asset and liability. Changes in accounting estimates result from new information are not corrections of errors. Materiality: Omissions or misstatements of items are material if they could make significant misstatements to financial statements and individually or collectively influence the economic decisions of users taken on the basis of the financial statements. Materiality depends on the size and nature of the omissions and misstatements judged in the particular circumstances. The size or nature of the item could be the determining factor of materiality. (b) collectible and usable in preparing and presenting those financial statements. Such errors include the effect of mathematical mistakes, mistakes in applying accounting policies, misinterpretation of facts, fraud or oversights. Retrospective application is applying a new accounting policy standard to transactions or other events as if it had always been applied. Retrospective restatement is correcting the recognition, measurement and presentation of amounts of elements of the financial statements as if a prior period error had never occurred. (ii) Would have been available when the financial statements for that prior period were authorized for issue. (b) Recognizing the effects of the change in the accounting estimates in the current and future periods affected by the change. 05. The accounting policies and practices selected by an enterprise should be applied consistently for all the similar transactions and events unless being required or permitted by another standard for classifying that similar transactions/events into groups with different accounting treatments for different groups. In this case, an appropriate accounting policy will be selected and applied consistently for each group. (b) If the change will result in the financial statements providing reliable and more relevant information about the effects of events or transactions on the financial positions, financial performance and the cash flows of the enterprise. 07. Users of financial statements need to be able to compare the financial statements of an enterprise over time to identify trends in its financial position, financial performance and cash flows. Therefore, the same accounting policies are consistently adopted within each period and from one period to the next unless the changes in accounting policies made under conditions specified in paragraph 06. (b) the application of new accounting polies for events or transactions which did not occur previously or that were immaterial. 09. The adoption of a policy to carry assets at revalued amounts under the VAS 03 “Tangible Fixed Assets”, VAS 04 “Intangible Fixed Assets” is a change in accounting policy but it is dealt with as a revaluation in accordance with VAS 03 or VAS 04 rather than in accordance with this Standard. (a) An enterprise shall account for a change in accounting policy resulting from the initial application of alegal regulation or a standard in accordance with the specific transitional provisions, if any, in that regulation or standard. (b) When an enterprise changes an accounting policy upon initial application of a legal regulation or standard that does not include specific transitional provisions applying to that change; or change an accounting policy voluntarily, it shall apply the change retrospectively. 11. When a change in accounting policies is applied retrospectively in accordance with paragraph 10(a) and 10(b), the enterprise shall adjust the opening balance of each affected component of equity for the earliest prior period presented and the other comparative information disclosed for each prior period presented as if the new accounting policy had always been applied. 12. Following the retrospective application specified in paragraph 10(a) and 10(b), a change in accounting policy should be applied retrospectively unless it is impacticable to determine either the period-specific effects or the cumulative effects of the change. 13. At the beginning of current period, If it is impracticable to determine the cumulative effects of applying a new accounting policy to the prior periods, the enterprise should adjust the comparative information to apply the new accounting policy prospectively from the earliest period practicable. 14. When it is impossible to apply a new accounting policy retrospectively because cumulative effects of applying that accounting policy is not determined to all prior periods, the enterprise, in accordance with paragraph 13, should apply that new accounting policy retrospectively from the start of the earliest period practicable. The change in accounting policies is permitted even if it is impracticable to apply the policy retrospectively for any prior period. Paragraphs 30 to 33 provide further guidances for the circumstances when it is impracticable to apply a new accounting policy to one or more prior periods. 16. The use of reasonable estimates is an essential part of the preparation of financial statements and does not undermine their reliability. 17. An estimate may have to be revised if changes occur regarding the circumstances on which the estimate was based or as a result of new information or more experience or subsequent developments. By its nature, the revision of an estimate neither relates to prior period nor correction of an error. 18. A Change in the measurement basis of information is a change in an accounting policies rather than a change in an accounting estimates. If it is difficult to distinguish between a change in an accounting policy and a change in an accounting estimate, the change is treated as a change in an accounting estimate. (b) the period of the change and future periods, if the change affects both. 20. If a change in an accounting estimates gives rise to changes in assets, liabilities or an item in equity, it should be recognised by adjusting the carrying amount of the related assets, liabilities or equity item. 21. Prospective adjustment of the effect of a change in an accounting estimate means that the change is applied to transactions, other events from the date of the change in estimate. A change in an accounting estimate may affect only income statement of the current period or income statement of both the current period and future periods. For example, a change in the estimate of the amount of bad debts affects only the current period’s profit or loss and therefore is recognized in the current period. However, a change in the estimated useful life of, or the expected pattern of consumption of the future economic benefits embodied in, a depreciable asset affects the depreciation expense for the current period and for each future period during the remaining useful life of the asset. In both cases, the effect of the change relating to the current period is recognized as income or expense in the current period. The effect, if any, on future periods is recognized as income or expense in those future periods. 22. Errors may occur as a result of recognitions measurement, presentation and disclosures of items reported in the financial statements. Financial statements are considered misstated and incompliant with the accounting standards and accounting policy if they contain material errors or immaterial errors made intentionally to achieve a particular presentation of financial position, financial performance or cash flow of an enterprise. Current period errors discovered in that periods should be corrected before the financial statements are authorized for issue. If material errors are discovered in a subsequent periods, these prior period errors should be corrected in the comparative information presented in the financial statements for that subsequent period (see paragraph 23-28). (b) Adjusting the opening balances of assets, liabilities and items of equity for the earliest prior period presented if the errors occurred before that period. 24. A prior period errors should be corrected by retrospective adjustments unless it is impracticable to determine either the period-specific effects or the cumulative effects of the errors. 25. When it is impracticable to determine the period-specific effects of an errors, the enterprise should restatet the opening balances of assets, liabilities and equity of the earliest period (can be the current period) for which retrospective restatement is practicable . 26. When it is impracticable to determine the cumulative effects, at the beginning of the current period, of an errors on all prior periods, the enterprise needs to restate the comparative information to correct the errors retrospectively from the earliest period practicable. 27. The Correction of a prior period errors should not be included in the income statement of the period when the errors are discovered. Comparative information should be restated if it is practical to do so. 28. When it is impracticable to determine the error effects (e.g. an error in applying an accounting policy) for all prior periods, the enterprise should restate the comparative information retrospectively in the financial statements of the earliest period practicable in accordance with paragraph 26. Correction of an error should be made together with the cumulative restatement of assets, liabilities and equity of the prior period. Paragraphs 30 to 33 provide further guidance for the circumstances when it is impossible to correct an error for one or more prior periods. 29. The correction of errors can be distinguished from changes in accounting estimates. Accounting estimates by their nature are approximations that may need revision as additional information becomes known. For example, the gain or loss arising from a specific conclusion in respect of a non-identified liability is not the correction of an error. 30. In some cases, it is impossible to restate the comparative information for one or more than one prior periods for comparison purposes. For example, it is impossible to collect information of prior periods for retrospective or prospective application of a new accounting policy (including for the purpose of paragraph 32 to 33); or to make a retrospective adjustments to correct prior period errors or it is impossible to establish these information. 31. In many cases, accounting estimate is required in applying a new accounting policies in presentation and disclosures of economic transactions and events in the financial statements. The estimate made after balance sheet date is subjective in nature. The estimation becomes more difficult in retrospective applying an accounting policy or making a retrospective restatement to correct a prior period error because of the longer period of time that might have passed since the affected transaction, other events occurred. However, the objective of estimates related to prior periods remains the same as for estimate made in the current periods to reflect the circumstances when transactions and other events occurred. (a) Information providing evidences of circumstances on the date as at which the transactions or events occurred. (b) Information available when the prior periods’ financial statements were authorized for issue. For certain types of the accounting estimates, for example fair value estimate, it is impossible to distinguish these information without reference to the market prices or the observable information. It is impossible to apply a new accounting policy retrospectively or correct an error retrospectively involving if material accounting estimates were made without distinguishing these two sources of information. (c) estimating the value measured, disclosed and reported in the prior period. Example 1: When an enterprise corrects a prior period error in recognizing the value of a financial asset which is classified as held-to-maturity investment under the accounting standard “Financial instruments: Recognition and Measurement”, it cannot change the measurement basis for the reporting period even when the management has subsequently decided not to hold the asset until its maturity date. Example 2: An enterprise corrects a prior period error in calculating the obligations relating to the accumulated sick leaves, it should exclude the flu-virus epidemic happened after financial statements were authorized for issue. When restating the comparative information of prior periods, the significant estimate is required. However, this does not prevent adjusting or correcting the comparative information. (h) The reasons and description of the accounting policy application of how and from when should be presented if the retrospective application is impracticable in accordance with the paragraphs 10(a) or 10(b) for a particular prior period or the earliest possible period. The information is not required for disclosure in the financial statements of the subsequent periods. (e) The reasons and description of the accounting policy application of how and from when should be presented if the retrospective application is impracticable in accordance with the paragraphs 10(a) or 10(b) for a particular prior period or the earliest possible period. 36. The enterprise is required to disclose the nature and value of any change in accounting estimates that affects to the current period or is effects expected to the future periods unless it is impracticable to determine. In such case, the reason is disclosed. (d) If the retrospective restatement on a particular prior period is impracticable, the reason and description of how and when the correction of error should be disclosed.